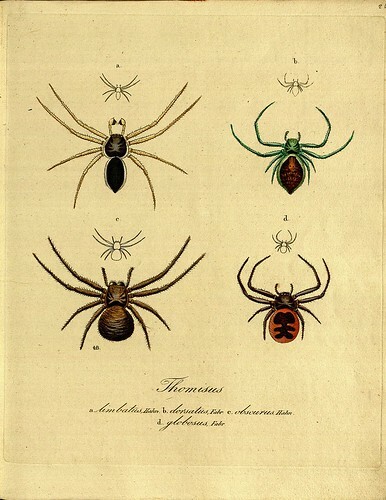 Carl Wilhelm Hahn (1786-1835) was a German zoologist and artist. 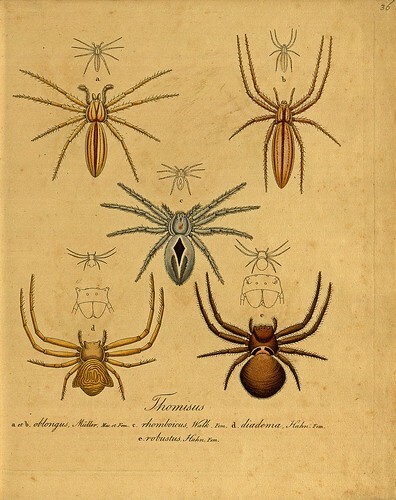 Following a short stint in the armed services, Hahn completed a PhD and took the unusual step of setting himself up as 'freelance natural historian'. 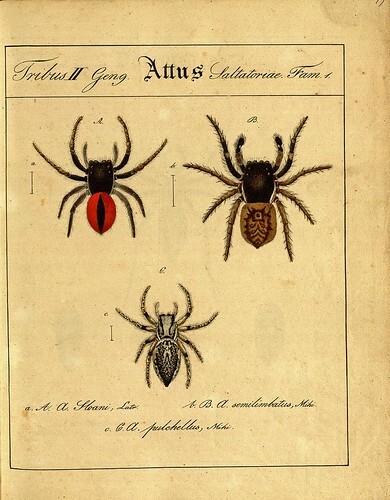 Biographical details are in short supply but it appears Hahn was at least acquainted with the leading naturalists from Nuremberg and his most important early work involved preparing an ornithological publication on bird species from America, Asia and Africa. 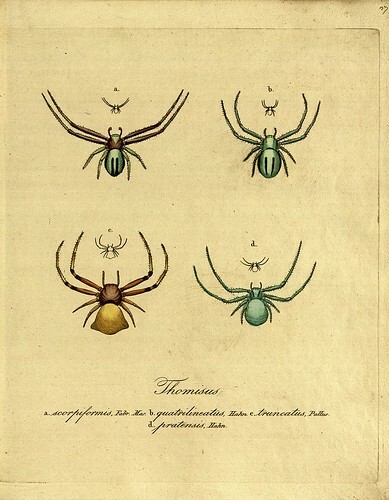 It is probable that Hahn contributed artwork to a number of books on insects, spiders and birds. 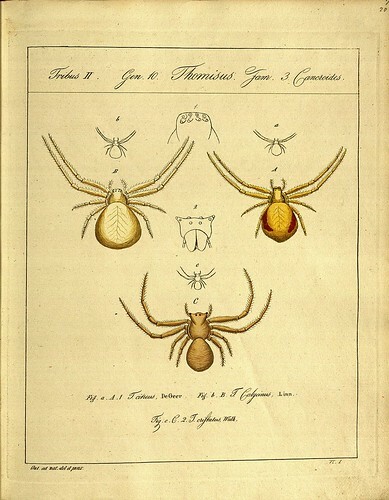 Hahn's most significant publication was the dual-titled 'Monographie der Spinnen / Monographia Aranearum' (Monograph of Spiders) which was issued in instalments between 1820 and 1836. Of the eight or so (near-) complete copies of this work in the world that have survived, none is apparently a definitive version. The history of the publishing is complicated, involving a change in printers following a quarrel, a small number of subscribers, unauthorised episode issues and, when combined with a sixteen year period of publication, the scarcity of complete works becomes understandable. 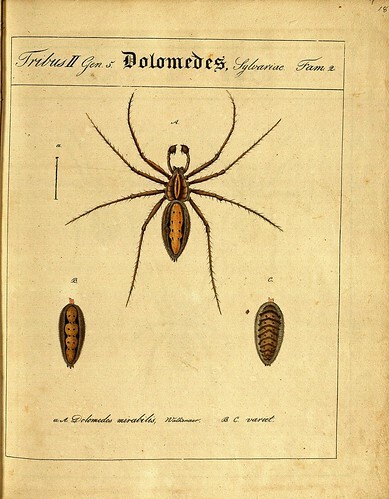 'Monographie der Spinnen' was the first ever German monograph on spiders and one of the earliest publications anywhere devoted solely to spiders. 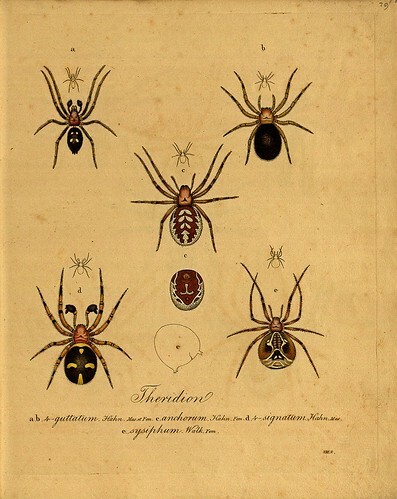 Hahn provided the original descriptions of a number of previously unknown spider species together with accurate illustrations, so the work is regarded not only as an important historical scientific document, but is still cited today as a primary source in the field of arachnology. 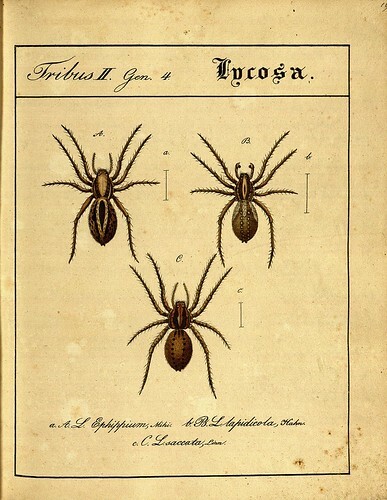 'Monographie der Spinnen' was recently digitised by the University of Heidelberg (click on 'Titleblatt' and then 'Vorschau' for thumbnail pages). I've included half (or maybe a few more) of the available plates above. The Wikipedia article is the most useful background reading online. Although it's not necessarily great in terms of readability, it seems to be fairly well researched. One of the sources for a lot of the information in the Wikipedia article was the German/English commentary by Peter Sacher that was included in a 1988 reprint of 'Monographie der Spinnen'. 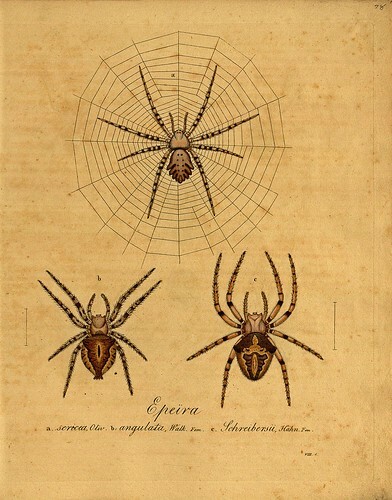 I love spiders. I was once sacked from a job painting petrol stations because I was more interested in safely moving resident spider families from the roof eaves during surface preparation than I was in getting the job done quickly. True story. YAY! Thanks for this, PK! Spiders are such beautiful creatures. I am so pleased to have lucked upon your blog earlier this year. I think it is just amazing. 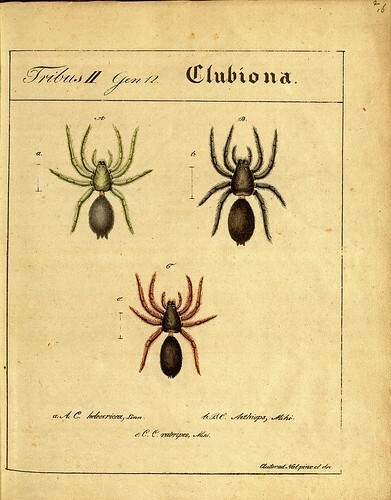 Thank you for so many great posts (love the spiders!) and have a terrific New Year! J'espère que cette nouvelle année sera aussi enrichissante que l'année dernière pour l'ensemble des visteurs de votre merveilleux blog. I think it was Albert Einstein who said "Never lose a holy curiosity." You continue to inspire. Thank you for your time and notice. I'm honored. Wishing you a warm and wonderfully aesthetic New Year! 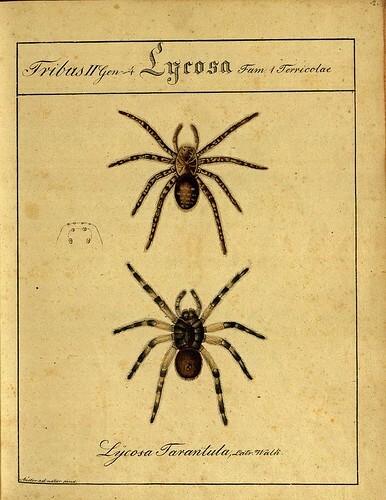 The Lycosa tarantula is strangely less furry than some of the other spiders shown, and nothing like the extremely furry tarantulas I've met. 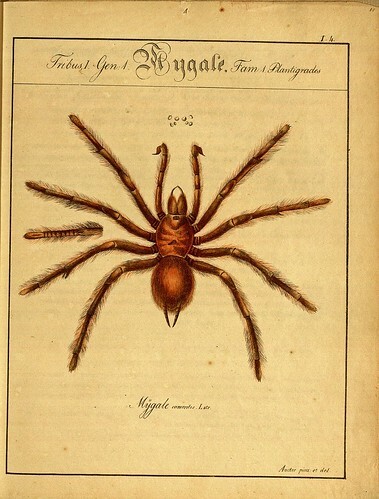 I wonder if it's a completely different species than what's called a tarantula in the US. I would not go so far as to say I love spiders (especially when they appear in my bedding), but they're always interesting and I do make an effort to protect them. Good Lors! I can't help but want to swat them! 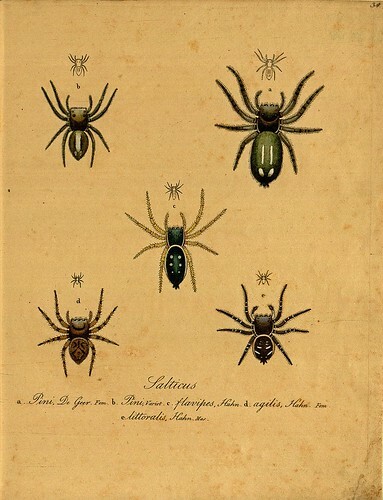 I love spiders and other little jewel critters too. We try to take care of them at my house and maybe scare off undesirable visitors. 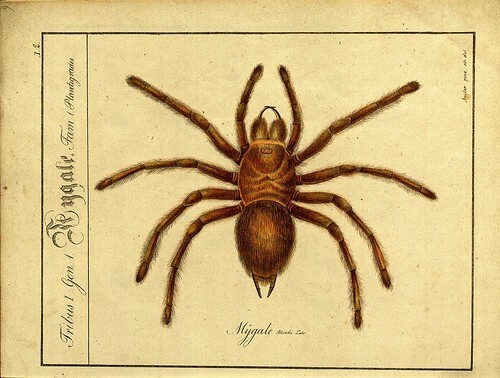 i love these spiders so much. and i just realized that if you scroll through them fast it's like a flipbook and they seem to be wiggling! How very beautiful they are! I treat spiders with healthy respect, and I would kill any that were a threat, e.g. 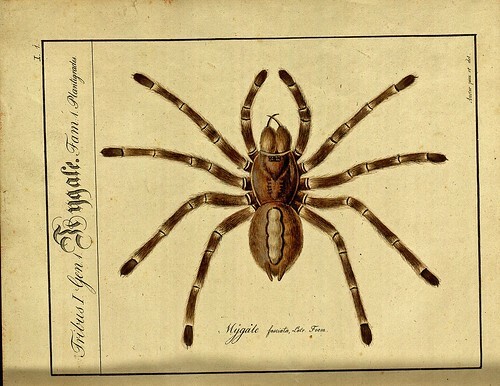 I stamped very smartly on a white-tail that crawled out of my elderly mother's washing once (exceedingly venomous Aussie spider, causing extreme pain). But that is very rare, and normally I too go out of my way to protect them. They are such sentient beings!